We all know that to lose weight, you have to burn more calories than you take in, eat less and move more. The fact is that, doing all these things to lose weight could be very difficult and tasking. Working with an exercise plan and cutting down on calories is a lot harder than it sounds. Making mistakes are inevitable. 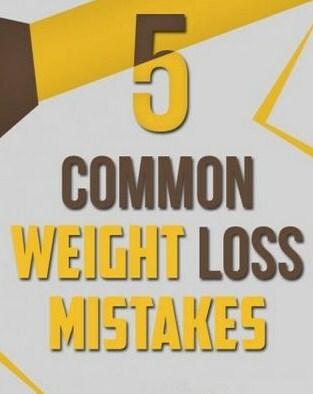 Here are some common mistakes we make in our weight loss journeys and how we can avoid them. The recommended amount of daily vegetable consumption is 2.5 cups daily but most of us fail to do that. Add veggies into every meal you are preparing to eat. You could just add sliced tomato on your morning toast or spinach on your chicken or turkey sandwich. Most people on the weight loss journey think they just need to do more cardio workouts. Well, this is so wrong. You need to add strength training to burn fats. Some experts have said if you spend time in the weight room, you will amp up the baseline amount of calories you burn each day which can help you lose weight faster. You may not like to pick up the heavy weights even if you are spending time in the weight room. You might be making a mistake here. Using heavier weights for fewer reps can burn more calories than using lighter weights for more reps. but if you aren’t sure of which weights you should use, you might have to ask your trainer. You just have to lift more to lose more. One major mistake a lot of people make is avoiding to eat before workout. A research done in the university of Arkansas showed that women who ate a high-protein meal before moderately working out for about 30minutes boosted their calorie burn than the ones who didn’t eat anything at all. So you might want to avoid making this mistake. Stress can come in different forms. You need to learn different stress-management techniques to help you lose more pounds. Stressing yourself out about the scale alone can make you gain more pounds. When you are stressed you tend to eat more. You have to learn how to avoid anxiety and emotional eating which could help you speed your weight loss up in the process. Lastly, it is all about consistency. You have to be consistent and shouldn’t expect results in one day.